Austin From Scratch: An Interview with Taylor “Thunder”, Co-Founder of Thunderbird Energetica | Shafer...Power! When we arrived at the Thunderbird production facilities, we were immediately greeted by Taylor and provided the royal tour. 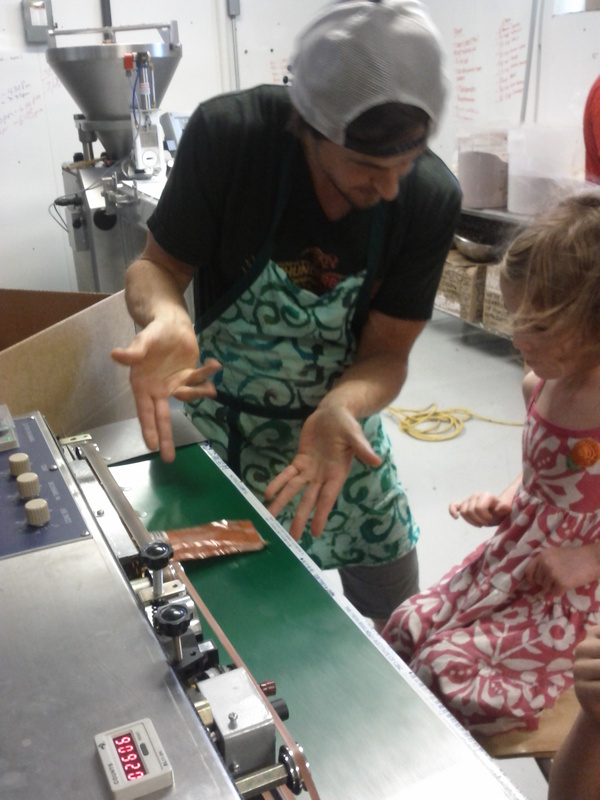 The kids were amazed to see all the natural ingredients, the massive mixing machine and the thingamajigger (not the official name) where the raw ingredients were consolidated and converted to energy bars. Next in line was the dehyrdator (again, unofficial name) and the packaging/sealing machine – see picture below. Once the bars were sealed, they were placed in a box – 15 per carton – and were ready to be shipped across the globe. Naturally, I’m oversimplifying the process but Taylor was able to explain it in a way the kids understood and it was apparent he and Katie had put a lot of time and effort into making Thunderbird what it is today. Once the tour was complete, Taylor was kind enough to sit down and answer some questions from the kids. Ride bikes, play with my brothers, make food…believe it or not…and eat food and swim. How did you go about learning as a kid? When Katie and I first started dating about eight years ago, we started a recycling business in Austin. And so that was the first time we were entrepreneurs. We were doing recycling at all the local restaurants and it was really dirty and stinky and was hard work…and we always got glass stuck in our fingers. Our real passion was always working out and biking and running. And we used to eat a lot of bars that we didn’t really like that much so we started out making our own bars. So I guess eight years ago we started out being entrepreneurs. Getting to be with my dog if she’s really lonely. She doesn’t come to the kitchen but if there’s a day I don’t have to go to work or if I wanna take her for a walk in the morning, I can always do that. Whereas, if I had to work in an office on someone else’s schedule, I wouldn’t get to see my dog that much. It’s really weird, but it’s my favorite thing. Definitely the amount of hours that you have to work and the risk that you take. Katie and I put two years of our lives into this and there’s never a guarantee that it’s gonna work out. So that’s kinda scary. But the rewards outweigh that and those are the hardest parts for sure. What would you be doing if you weren’t running Thunderbird Energetica? Right now, I would probably be riding my bike outside with Katie and we’d probably be on mile number 50 of our ride. But other than that I used to a physical therapist so I helped people get better after they had injuries. That’s what I went to school for. What’s your favorite Energetica bar? Definitely the one we were making in there today…the Cacao Hemp Walnut. It’s really yummy and I have this bias; I feel like every ingredient in that bar has been eaten by human beings for more than 10,000 years. It’s really a special bar and the ingredients are really powerful and all these indigenous ancient tribes would eat them. So I feel like I get connected with history when I eat that bar. Yes, I would say the number one thing is you gotta just go for it. If you have an idea, you have to act on it. You have to start and you have to make it happen. Because so many people in the world have really good ideas, but maybe only 1% of those people actually try to make their vision come true. So if you actually just try, and try hard, there’s a good chance you’re going to succeed and win. At this time, it was turn for Malia to ask her favorite question. Why did you make up this idea? Because Katie and I were sick and tired of eating all the other bars that we could buy at the grocery stores. We didn’t like the way they tasted, we didn’t like the ingredients they were using in them and so we were making these bars for ourselves to eat on bike rides and on runs. And Katie hurt her knee and had a lot of inflammation because of that injury and we so made a bar that kinda helped her heal with a lot of anti-inflammatories. And it was such a hit and she loved it so much we were sharing it with our friends that we decided there was an opportunity to take this into the marketplace. So, there we were…we decided to go for it. ← How should I raise a 12-year-old girl to be a successful entrepreneur? You are so onto something revolutionary!!! I am going to try this specific bar, since the owner plugged it. Thanks for the article, Owen! My fave bars! Love them! Really enjoy these interviews. Thank you!